Behold the lack of calamity on Elias's desk. We’re back with more desk details! 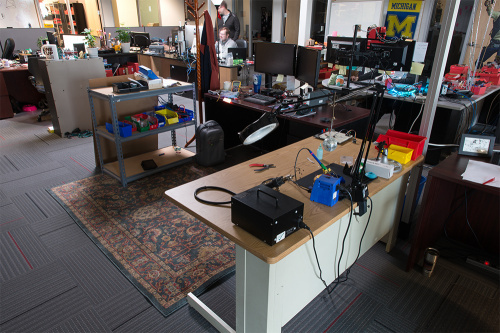 This is the latest in our series where we barge in on people while they’re working and kick them out so we can document their desks in all their chaotic glory. And because we know that just isn’t enough information, we ransom their workspaces back to them in exchange for some details on what they have on their desks and why. We do this for you! Clicking the image will enlarge it, so you can experience the full resolution of each person's home away from home. Today we’ve inconvenienced Elias! Let’s get into it. Welcome to my office, er, delineated work space! You see that rug marks my wandering boundaries, and it also marks me for various office jokes about "making myself at home." I'll give you that one. Here is the working area where I spend 90 percent of my time. I know what you're thinking, "What smooth criminal left those fingerless gloves so tactfully on your desk?" They're actually mine, so I guess that makes me the smooth criminal (guilty as charged), and below them I'm hiding products going live this week. On my dual monitor setup I have a character from one of my favorite cartoons of all time (20 space dubloons for whoever gets his name first in the comments). Dangling off of the monitors I have what any VIM user might have: sticky notes to some new VIM shortcut that you just learned. You'll notice my keyboard is bite-sized, or shall I say, "VIM-sized," since I basically never want or need to leave my keyboard to do anything on my computer. I figuratively never leave my desk. There are my headphones, which helps immeasurably with noise in an open area office, plugged into my headphone amp that keeps the beats crisp. At the foot of the most common organizational office relics are two stones: apatite and tiger's eye, given to me by my wife to clear mental blocks and keep me motivated. Are you giggling? Don't hate on ancient magic! We time our computers using quartz crystals; who's to say that tiger's eye isn't keeping me from wandering onto YouTube?! The EYE is always watching in this office. Did you think that was a Lord of the Rings joke? Nerds. 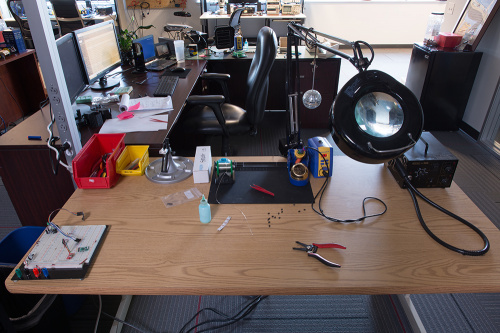 Nothing too surprising here: a disco ball for soldering party time, typical soldering necessities and a breadboard that an unknown coworker was giving away. My favorite items on this desk are, in order: disco ball, mansion-sized bread board, silicon mat and my duck-billed PCB clamp with the giant metal base. I honestly don't know how I soldered anything without it. Last but not least, we have the infamous metal shelves (infamous to a population of one: me). Infamous because they're supposed to organize my ever-expanding catalog of engineering parts and accessories, but this has proven to be impossible to plan for and a constant struggle to contain, and so they fail their primary function. At the same time they're just really good shelves and look at them hold these bins! Fantastic! I know this has been asked before, but there must be something better than those shelves with a million small plastic drawers that feel cheap and can't stand up on their own. I'll leave it at that, thank you everyone for having a look-see at all my doo-dads. It's been a pleasure to banter at you all! The pros and cons of working here - since we can run over to the front desk to pick up orders, there's no need for a red box to ship them. I've definitely got a good collection of heavy duty plastic zip bags at home though. Enjoyed reading your write-up! - nicely done! I think the rug is a great idea. Life is short. Enjoy your space! Love the Prismo background! How do I claim my space dubloons? 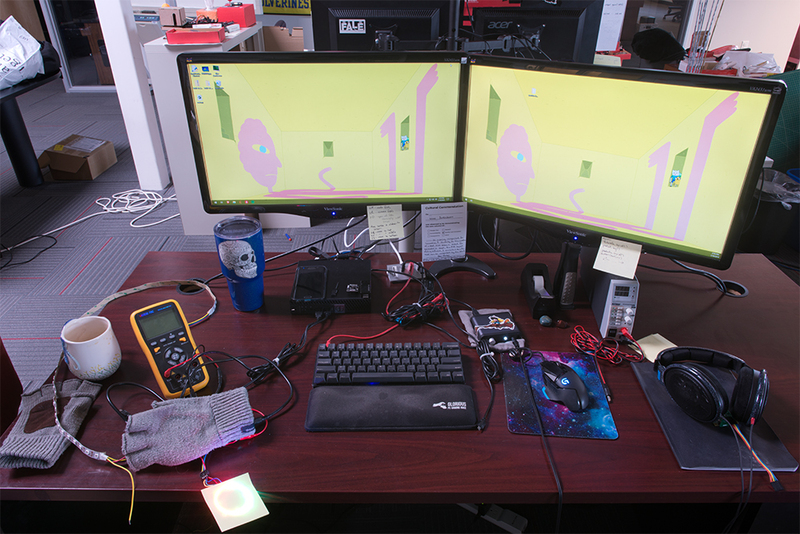 No anit-static mat, ESD monitors, and probably no wriststraps. The wikipedia Vim link is broken. 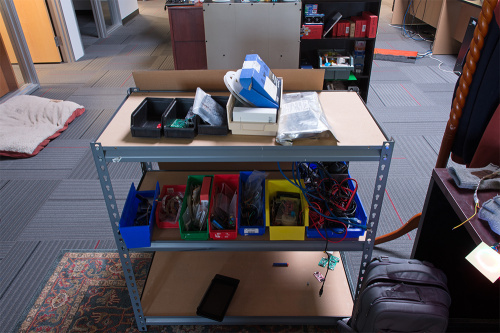 Thank you SparkFun visitor! It has been fixed.